The image above is an iconic view of Sydney, familiar not just to Sydneysiders and visitors to Sydney, but worldwide. Indeed, The Sydney Harbour Bridge is an icon of Sydney, representing the harbour city around the world and showcasing the beautiful harbour to millions of people. Yet the bridge is not just a stunning structure, it has an amazing history. Although today many think of the Sydney Harbour Bridge as simply an icon of Sydney, at the time that the bridge opened in 1932 it was icon of a whole different sort – an engineering marvel in itself. Yet the history of the bridge dates back well over a century before and the original bridge envisaged was a very different structure. In the early days of the colony, the famous convict architect Francis Greenway spoke with Governor Macquarie, suggesting a bridge be built in roughly the same place where the Sydney Harbour Bridge stands today. Of course, Greenways lofty dream didn’t come to pass, but by 1901, when Federation of the Australian States and Territories occurred, the need for a bridge across the harbour was well recognised. The year before, in 1900, the government called for people to submit designs for just such a bridge but all the designs were unsatisfactory, so the plans were again put aside. In the wake of World War One though a real quest for a bridge spanning the harbour began. In 1923 Dr J.J.C Bradfield oversaw tenders for either an arch or cantilever bridge. Eventually, Bradfield would go on to oversee the entire design and building process of the now iconic bridge. The tender itself was won by a company from England, Dorman Long and Co. Ltd. They submitted a design by Sir Ralph Freeman for an arch bridge, and construction on the bridge began in 1924. Hundreds of families were displaced during the construction as entire streets of homes and businesses were resumed and demolished, without compensation, to make way for the now iconic bridge. The image above is a beautiful snapshot of places which many Sydneysiders and visitors alike are quite familiar with – Dee Why and Curl Curl. Both of these areas are popular with beachgoers, for their beautiful beaches and well established beach culture. Yet the Dee Why and Curl Curl of today is also vastly different to the places which are captured in the photograph. Dee Why and Curl Curl are today, mainly residential areas with row upon row of houses, and of course the associated shops and amenities. Yet the photo above shows a Dee Why which was relatively unsettled. In fact, the caption describes settlement in this area of Dee Why and also Curl Curl as ‘sparse’. Settlement began at Dee Why and the surrounding areas early in the 1800s, with William Cossar given the first grant in 1815 (though the grant was not confirmed until 1819). By 1825 though, James Jenkins owned this grant, and, along with his daughter Elizabeth, owned all of the foreshore land all the way from Mona Vale to Dee Why itself. Elizabeth Jenkins was intensely religious, and very impressed by the Salvation Army, and in 1885 she gave them 30 acres of land at the Narrabeen Lagoon. She later gave them more land at Dee Why, and eventually transferred all of her land to the Salvation Army, in return for an annuity. She died in 1900, and after legal battles with her nephew Phillip, the Salvation Army continued to control her land, paying the annuity to Phillip until his death in 1931, after which, the land passed more completely to them. Even before Phillips death, the Salvation Army decided that it owned far too much land and that the money raised by selling the land could be used for the good of the community. In 1911 the subdivision of Salvation Army lands began, coinciding with subdivisions by other land owners around the same time. It was about this time that the actual town of Dee Why began to develop. In 1911 there had only been five homes or dwellings in Dee Why, but by 1915 this number had grown to 125. However, most of these houses were used as weekenders or holiday homes. It was not until the 1920s that more permanent settlement at Dee Why began, with the establishment of a school, Dee Why Public, in 1922. Then, in 1924 the Spit and Roseville Bridges were opened, making access to Dee Why much easier, and settlement again grew. By 1932, when the photograph above was taken, settlement was slowly growing, but still sparse outside the town centre. Yet over the coming decades, people continued to move into the area and build homes, until the Dee Why we recognise today was established. This week, there have been a number of news reports around possible changes to trade agreements between various countries. With so much interest in trade, it seemed the ideal time to share this fascinating glimpse into the history of trade in Sydney, and in Australia more generally. The image above, showing Snails Bay in Birchgrove, provides an amazing glimpse into the history of Australian tariff policy. The image, which shows a freighter unloading Canadian lumber offshore in order to avoid the tariff on Canadian lumber, particularly highlights the lengths that some importers were willing to go to in order to avoid paying the import tariffs on various products, in this case, Canadian wood. In the 1930s tariffs on goods imported to Australia were substantially increased in order to protect Australian industry and employment. This was the time of the Great Depression, and the tariffs were an attempt to not only protect Australian industries and workers, but also to deal with various problems associated with international payments. Many of these tariffs remained unchanged until the 1970s, and the tariffs on imported wood still appear to be debated today. Wool train along side R.R. Power Station on Hay St. Australian Mercantile L. and F. Co. Ltd. Wool storage beyond power plant. A new year is well and truly underway, and with it, comes all sorts of resolutions. Mine – to digitise over 1200 negatives before the year is out! The above and below images are just two of the early images to be shared by the blog – two of hundreds of beautiful images taken by an unknown photographer. 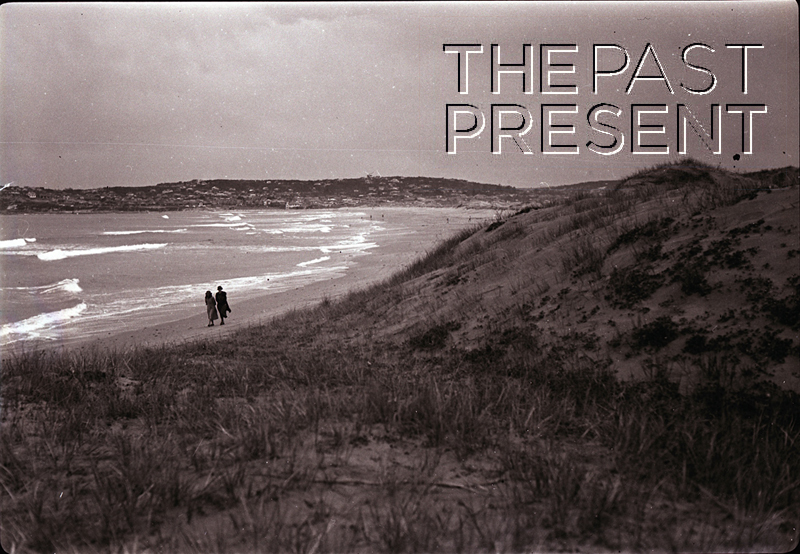 The photos all date from circa 1936, and provide a powerful and unseen glimpse into Australia’s history. Some of the images in the collection highlight home life, examining types of houses, and their captions even making mention of whether the homes were of the ‘better class’, ‘old style’, ‘modern apartments’ or ‘homes of the poor’. Other photos, like the one above, turn the photographers lens on the working past of Australia – industry, transport, agriculture, and the buildings which once hid a bustle of activity, from wool scouring to generating power. Terraces of old houses in the Glebe. Girls playing. Campbell St. The saddest aspect of this – the photographer of these amazing images, so beautifully framed, intricately catalogue, described and carefully preserved, is completely unknown. The only glimpse we have of him (so far) comes from a negative – the one above, where his shadow appears. In the printed photo which accompanies the negative (and nearly every negative has one), it was edited out, but I love the original, complete with the ghost of the photographer. I wonder – has anybody seen these images in some publication? If you ever recognise one of the photos on the blog (and I will be posting many, many more over the coming months) from some publication or other, or even a public collection – please contact me. I would love to put a name to this mysterious photographer. This image of Dee Why is a stunning glimpse into a landscape which once was common to Australian beaches – sand dunes. Sand dunes once dotted Australia’s shoreline, being particularly famous at Botany Bay, but over time they have eroded, or been more drastically reduced by activities such as sand mining. Dee Why beach has long been popular with surfers and families. In 1914, only a year after the Salvation Army began to sell off holdings they had in the area, a surf club was established and they even held the first surf carnival. By the 1920s the area had become a popular place for people to spend their holidays, with a huge number of holiday cottages, a camp ground and plenty of room for caravans. No doubt many younger visitors relished the chance to slip, slide and ride down the once enormous sand dunes. Over time though these dunes eroded, with natural forces blowing the sand away, much of it ending up in Dee Why Lagoon. Although sand dunes are still an impressive part of Dee Why beach, the majestic dunes pictured in this photograph are likely a thing of history. The Past Present has decided that this week it is time to head further afield and visit one of the other capitals which features in the vast collection of images. This image of Melbourne, taken circa 1936 by an unknown photographer is a beautiful and evocative snapshot of Melbourne’s Little Bourke Street (south) and a few of its residents. Little Bourke Street is at the heart of Melbournes historic Chinatown district. In the early 1850s Chinese people began arriving in Melbourne seeking fortune on the Victorian goldfields. In 1854 lodging houses for these immigrants began to appear with the first being in Little Bourke Street and Celestial Avenue. The area was cheap, convenient and the immigrants could purchase supplies on their way to the goldfields. Soon enough merchants, stores and even benevolent societies began to appear, all aimed at the new and ever changing community of the emerging Chinatown. 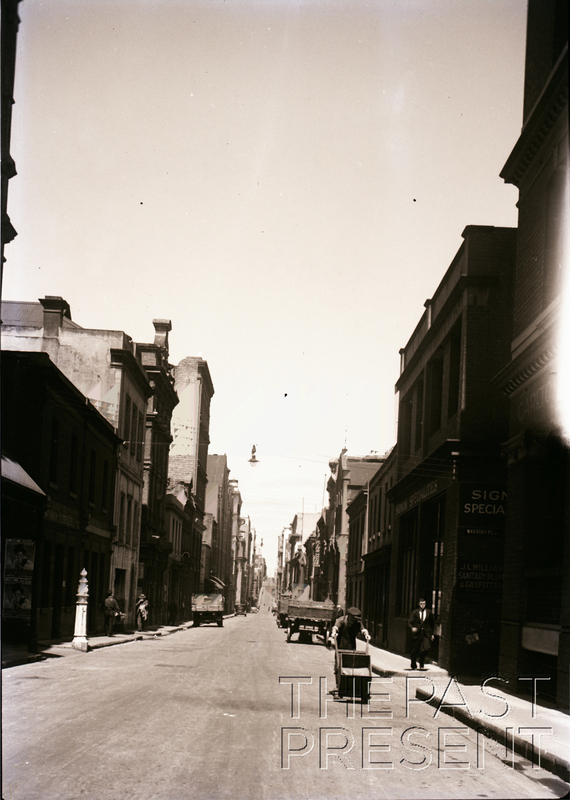 Following the gold rush many people in rural areas began to move to the cities and for the Chinese immigrants Little Bourke Street was the ideal location. It served as a focal point for the Chinese in Melbourne with many living in the area, but others simply visiting for meals, to gamble, to smoke opium or for religious ceremonies. By 1900 Melbournes Chinatown was well established and between the turn of the century and 1920 it grew rapidly. In the 1920s and 1930s though, with restricted immigration and a shift towards establishing businesses outside the central business district, Chinatown began to shrink. In the postwar era new immigrants arrived, but Chinatown continued to diminish until in the 1940s and 1950s people began to suspect it would disappear entirely. In the 1960s, fortunately the area was saved and today Melbournes Chinatown is one of the oldest in the Southern Hemisphere.